Even before Rockstar released GTA V, we knew that the list of vehicles was going to be extensive, and even more so with the release of Grand Theft Auto Online. Choosing the right car can be a very difficult thing because the choice of cars that you can steal or purchase are endless — well sort of. You can go for something very tasty indeed, but you will have to work hard to raise the case. However, you are still left with the decision as what to buy because as with all cars they will handle differently. Thankfully, a new GTA V and Online infographic was released several days ago, which compares car stats. We wanted to inform you of this at the weekend, but for some reason it slipped our attention. With the help of this infographic it should help you come up with a more informed decision, rather than making your usual rushed one. You will see in the image below (which you can click on to make larger) that car acceleration, braking, handling and speed are all compared. 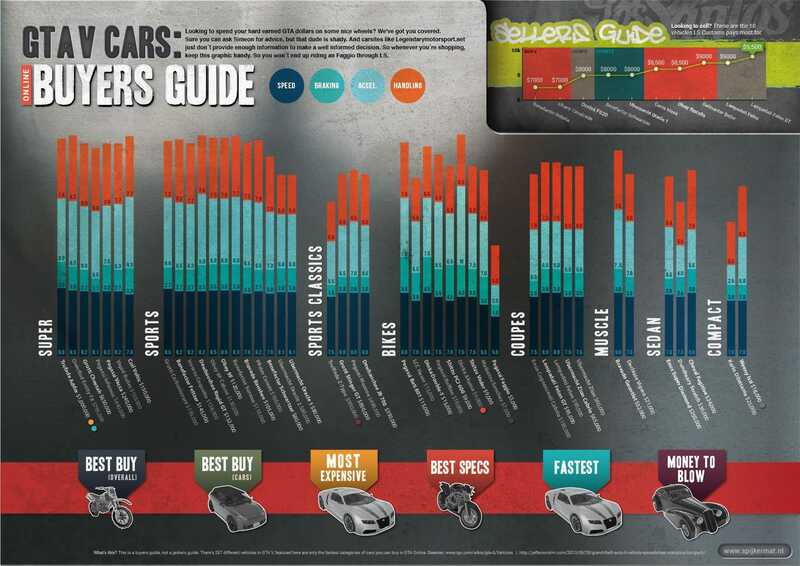 Also on the infographic is the best-in-class vehicle list, such as those that offer the best speed and specs. We are sure once you have studied these figures that you will be eager to get one of these vehicles, the question is will you work hard to buy one, or go down the more traditional route from the franchise and steal one instead?